I am dealing with some seriously cold days here in the southern city of Adelaide. Brisbane Queensland is tipping the temperature charts at a balmy 25 -30 degrees celcius whereas Adelaide is crawlinng to a maximum of around 12 degrees (right in the heart of comfort eating territory!! )This doesn't have to be pies,chips, sausage rolls or fast food- the humble Spag Bol (or spag bog! as we call it) will do the trick. It is the quick and easy meal that is cheap, high in iron and protein, suitable from a toddler to a grandparent and anyone in between and a meal you can 'hide 'or 'enhance with ' some vegies to make it a complete meal. 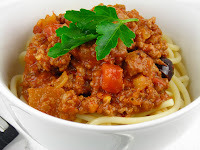 I have included my husbands 'no fail' spaghetti bolgnese recipe- let me know how you have enhanced your spaghetti recipe? I think Spaghetti Bol is my weekly standby. I make a vegetarian one. Your new book sounds great i might have to check it out. I have an almost 4 year old who would eat anything til he was two and is only now starting to widen his repetoire of food.